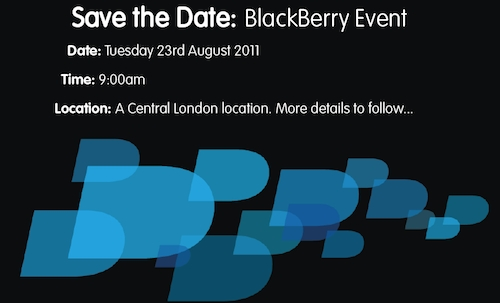 BlackBerry UK Press Event being held on August 23 | BlackBerry Blast! It looks like Research in Motion may have more BlackBerry announcements to make. They recently announced their lineup of BlackBerry 7 devices, and now they have scheduled another press event for August 23rd. The invitations are going out, but nobody knows what the press event is for. In fact, RIM hasn't even given a final location for the event. They simply say "a Central London location. More details to follow." Will they announce more BB7 devices? Is it something completely different? Could they make a QNX-bb announcement? The event will take place at 9 a.m. on Tuesday, August 23rd. That's all we know. Anyone care to venture a guess?